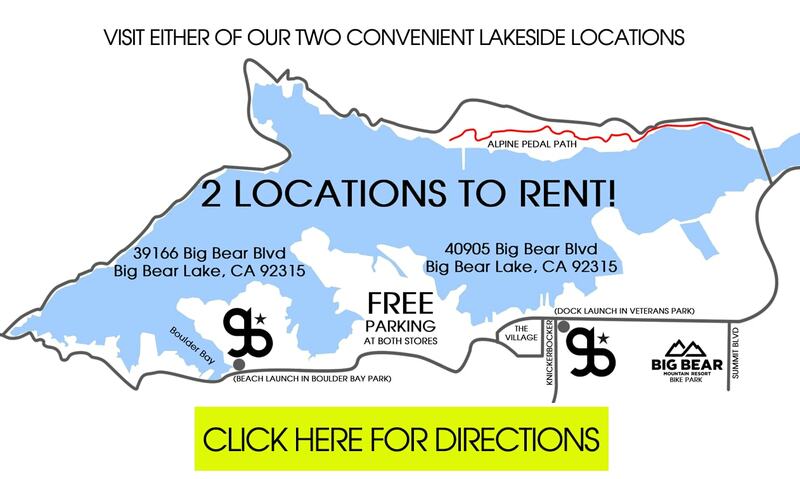 We make it easy to explore Big Bear with rental stores at the most scenic attractions; located at two of Big Bear's nicest parks where the whole family can enjoy relaxing on a sandy beach and play by the lake! Here at Get Boards in Big Bear we make YOUR vacation OUR priority! To provide you with the best rental experience possible, we specialize in a large selection of top quality equipment, regularly maintained and inspected by our knowledgeable and certified staff. Our No-nonsense rental fees include everything you need- from helmets for bike rentals to life jackets to wear on our permitted kayaks and SUPs- at no added cost! We set ourselves apart from other rental companies by promising NO hidden charges or deposits, and NO additional cleaning fees! Whether you're a first-timer learning the basics of paddling or a kayak enthusiast looking to find the best spots on the lake, our experienced staff with provide you with expert advice. AND we include a free map with all of our rentals! Want to bring along your furry friend? All our kayaks and SUPs are pet friendly! Your pup can ride with you anywhere on the lake at no extra cost! Full day (8 hour) rentals include FREE DELIVERY right to your home or rental cabin, available anywhere in Big Bear Lake! Don't need your equipment for a whole day? For a flat delivery rate of $20 each way, we'll bring your 4 hour rentals straight to you, and pick them up when you're finished! Reserve Online Now! Or call us today at (909) 878-3155 to make your reservation! Download or print our Getboards.com coupon for 10% off your kayak, paddle board or bike rentals! With our private dock right next to Veterans' Park we are more than capable of accommodating your large group needs! Our dock rentals provide each participant with access to any of our equipment, giving your group the flexibility to try both kayaks and stand up paddle boards for the optimum paddling experience! Click here to view our Rental Rates! Don't need to rent our whole dock? We give a 15% group discount to groups of more than 10 people all paying together!